Charlotte is a geoscientist and infrastructure development consultant. She works with Inuit and First Nations to gather traditional knowledge and apply it to modern projects. Charlotte is fascinated with the Arctic because of the most interesting mix of geological features, glaciers, glacial landforms, and permafrost features that can be found in the North. Her interest in the Arctic region ranges from the very small—such as permafrost-affected soils—to the global—such as the integrated climate system that drives glaciers and ice caps. Charlotte has a master’s degree in Geology and has published numerous maps and reports, including public information material. Her love affair with Arctic and sub-Arctic environments started in Yukon, where she lived from 1987 to 2000. Charlotte has been working in the territories since then, and has never looked back. As a geologist with a strong interest in landforms and material behavior, she became immersed in the influence of glaciers and permafrost on terrain, soils, wetlands, and vegetation. This interest drove her to work as a senior geoscientist on a wide range of projects with engineers, biologists, archaeologists, and communities in all the Canadian territories. Charlotte has also worked in other circumpolar regions such as Alaska, Tibet, China, and Russia. Her understanding of the integration of climate, soil geology—and how these factors affect project planning and infrastructure development—led her to work with engineers. 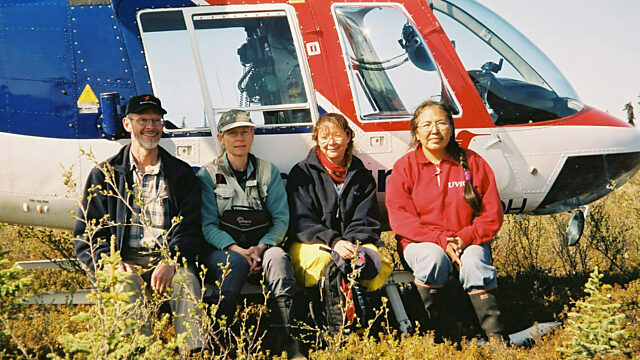 Relationships of land and soil with vegetation and wildlife habitat soon led her to work with social scientists, including Inuit and First Nations communities, to gather traditional knowledge. Over the years, she became an project manager and became involved with community consultation in Nunavut and the Northwest Territories. Charlotte is currently working in Nunavut on marine infrastructure projects as an advisor to the Nunavut Government, building harbours in the communities of Iqaluit and Pond Inlet. She is working in the communities and with engineers to incorporate the knowledge and advice of Inuit and residents to the project design. This has been a rewarding and successful endeavour. Charlotte is keen to bring life to geological processes, landforms, and permafrost as well as the recent stories of glaciations and deglaciations. There is a wide range of landforms to observe during the trip. The geology along the coastlines of areas visited can be complex and bears witness to millions of years of geological events.